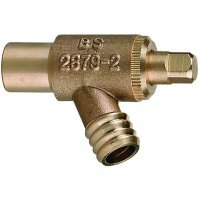 This is an immersion heater thermostat replacement guide, for anyone who is looking to change their immersion heater thermostat and the heating element. I am a professional plumber and heating engineer – I get called out to jobs like this regularly. Some of the photos in this post are from a call out job that I did for a lady who was not getting any hot water. Make sure you have done all of the checks needed to find out the exact problem before replacing any parts. You might only need to replace a fuse or find that the fault is somewhere else. Use a qualified electrician if in doubt. 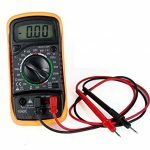 First of all, I used a multimeter to test the immersion heater thermostat and found it was not getting the correct reading. The next step was to isolate the electric supply at the main consumer unit where all of the fuses are. 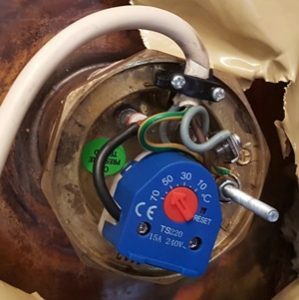 It’s best to just isolate the electric circuit, or fuse, that the immersion heater thermostat is connected to. It’s best not to turn off all of the electric because you don’t really want to turn the freezer off if you don’t need to. It may have its own electric circuit with just the immersion heater thermostat connected. Or it may be connected to the ring main circuit which has all of the plug sockets connected. Sometimes, it may even be connected to the light circuit. If it’s not labelled, you will have to keep turning one fuse off at a time. You need to keep trying until you find which circuit has the immersion heater thermostat connected. Next step is to drain down the copper hot water cylinder. You will need to find the isolating valve, or stop tap, on the pipe that supplies the water tank that supplies the hot water cylinder. It’s sometimes above the cylinder but could be in the loft with the supply tank. If you can not find one, then you will need to turn off the main stopcock that will turn off all the water to the property. Then open all of the hot taps to start draining down the water from the tank and cylinder. Then, you will need to find the drain off valve. This will be a little brass valve connected to a pipe at the bottom of the hot water cylinder. Once you have found this, connect a hose and run the hose outside to a drain ready to drain down. You will need to use an adjustable spanner, or pliers, to turn the nut on the drain valve anti-clockwise until the water starts coming out. Draining down the cylinder fully will take a while, so you may as well do something else while it’s draining down. When it’s fully drained down, you should be able to shake the cylinder quite easily. You will be able to tell that it’s empty. First of all, you need to remove the cover off the immersion heater thermostat. You can do this using an adjustable spanner to remove the small nut. Then, you will need to remove the cable using a small flat head screwdriver. I recommend getting a VDE insulated screwdriver that will protect you from any electric shocks. To remove the actual heating element from the hot water cylinder, you will need a blow torch and an immersion heater box spanner. I don’t recommend using a normal immersion heater spanner, make sure it’s the box spanner type. Although I have not tried the newer Monument 361T immersion heater spanner, they look good and solid. Some people like to leave the water in the cylinder to keep it more solid and easier to turn the spanner, just to get crack it open and start the process off. But, you do risk getting a leak doing this. You might rip the sealing washer which can prevent you from tightening it back up if it does leak. Or, worse still, tear the cylinder and ruin your day. You will need to heat the brass heating element using a blowtorch. This is because the heating element tends to seize on the cylinder and you can quite easily damage the cylinder if you don’t use a blowtorch to heat it up first. Just keep the flame on the brass inside the heating element for a few minutes. Keep moving it around so it heats all of the brass up evenly. Then, you put your box spanner over the heating element and use the bar that comes with it to turn it anti-clockwise. You might need to use a hammer to give it a couple of taps to get going. You should then be able to turn the rest with your hands. Always use caution when removing the immersion heater thermostat heating element. You can quite easily damage the copper cylinder and you might end up having to replace the full cylinder. That’s the hard part done, now for the easy part. 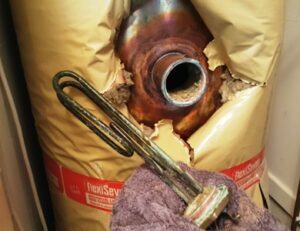 With the old heating element removed from the hot water cylinder, you should try to clean up any dirt and debris from inside and around the opening. Once this is done, time to fit the new immersion heater element and thermostat. You should get a sealing washer with it, I would also recommend using jointing compound on the thread to further stop any leaks. Next, you need to screw in the new element. tighten it up as much as you can, then use your spanner to fully tighten it. Then you can insert the thermostat and wire it up using the instructions supplied with the thermostat. Then put the cover on and tighten the small nut up. Now just close the drain off valve where the hose is connected, close all of the hot water taps and turn the water supply back on. Check for leaks and if all is ok, turn the electric supply back on. Copyright © 2019 Housewarm Ltd.